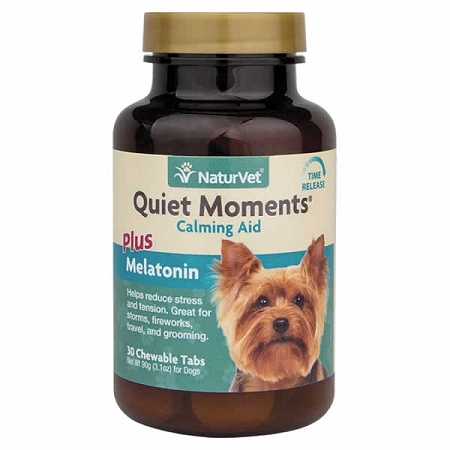 Quiet Moments Calming Aid with Melatonin for dogs helps to calm them during periods of anxiety, nervousness, tension or stress such as traveling, grooming, thunderstorms, 4th of July, or trips to the veterinarian. Quiet Moments is a natural way to calm down your dog and contains all natural active ingredients including melatonin, chamomile, passion flower, ginger, tryptophan and Vitamin B-1. 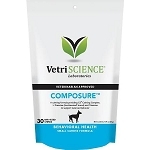 Chamomile has a wide variety of uses including for pets with nervousness and anxiety. Chamomile's high content of the amino acid tryptophan has been used for sleeplessness and insomnia for hundreds of years. It is commonly used as a mild sedative to calm the nerves, reduce anxiety and induce a state of pleasant relaxation without disrupting normal function or interfering with motor coordination. It is also an anti-inflammatory herb that has antimicrobial properties (for pets with skin infections) and for its ability to heal wounds. Chamomile should not be used in pregnant animals or those taking prescription anticoagulants. Passion Flower contains several flavonoids that exhibit a sedative effect on the central nervous system. Chrysin, a monoflavonoid, affects the central receptors of the brain and the combination of flavonoids act as an anxiolytic which helps to promote relaxation, soothe tension and relieve occasional anxiety and panic caused by emotional stress. Thiamine is considered an "anti-stress" vitamin because it is believed to enhance the activity of the immune system and improve the body's ability to withstand stressful conditions. Ginger has been used to increase peripheral circulation and may help with motion sickness. Excessive doses of ginger may interfere with existing cardiac, antidiabetic or anticoagulant therapies. Tryptophan is an essential amino acid that is required to produce vitamin B3 (niacin) and is a precursor for serotonin, melatonin and niacin. Tryptophan has been found to increase brain levels of serotonin, a calming neurotransmitter and/or melatonin, a sleep-inducing hormone. Studies with humans and animals have shown that serotonin nerve circuits promote feelings of well-being, calm, personal security, relaxation, confidence and concentration. Inactive Ingredients: Dicalcium phosphate, Dried Skim Milk, Magnesium Stearate, Maltodextrins, Montmorillonite, Natural Flavoring, Stearic Acid, Vegetable oil, and Whey. For dogs and puppies over 12 weeks in age. Give recommended amount 30 minutes prior to such episodes as mentioned above. This product is intended for intermittent use only.